New Zealand's most prolific winning reinsman of all time, Herlihy dominates the list of drivers of Inter Dominion Trotting Grand Final winners in a manner similar to that in which his Australian counterparts Brian Hancock and Natalie Rasmussen have captured the laurels in the pacing section. Herlihy's Trotting Grand Final victories have been recorded with Diamond Field (1994), Pride Of Petite (1997), Buster Hanover (1998) and Delft (2006). These triumphs form a significant chapter in the outstanding career to date of Herlihy, who, purely through innate ability, raced virtually out of nowhere into the forefront of the code. From modest beginnings in the mid-l970s, he quickly enhanced his reputation to become an enduring household name in harness racing in this part of the world. The Herlihy saga began when as a youngster in a "non-trotting" family in Te Awamutu he enjoyed spending school holidays helping his uncle, the late Arnie Gadsby, who was then stable foreman for legendary trainer Roy Purdon. Upon leaving school, Tony, as a 16-year-old, joined up with uncle Arnie, who by this time was flourishing as private trainer for high-profile Auckland owner Ted Bennett. From a small string in that stable came a tidy percentage of winners, most notable of them being 1974 Great Northern Derby and 1975 Auckland Cup victor Captain Harcourt. During eight years working full-time with his uncle, Herlihy launched his driving career as "probationer" (junior) at 19 years old in the 1977/78 season. Not possessing a family background recognised in the game, it took time to prove he was worth driving assignments. He won a couple of races in that first season and 11 the next. By his third season, Tony had reached the top of the juniors' list. In 1980/81 he shared the title with Cantabrian Paul Young, while in his final term at that level he was out on his own, his 42 wins well clear of runner-up Robin Swain's 27. It actually placed him fifth in the overall national premiership, and he became the first to rack up 100 wins whilst licensed as a junior. Having married Suzanne, daughter of Roy and Margaret Purdon, late in 1981, it was inevitable that Tony would become part of the powerful Purdon machine that incorporated the two thriving South Auckland complexes of Roy and his eldest son and partner Barry. Tony officially signed up with them in 1986, and it was a union ordained to be victorious. That season runner-up to arch rival Maurice McKendry in the drivers' premiership, Herlihy gained international acclaim when taking out the World Driving Championship from Compatriate and defending titleholder Bob Cameron in the 1985 series, waged on both sides of the Tasman. As first driver for the all-conquering Purdon camp, it was a foregone conclusion that Herlihy would add to his credits. In the 1986/87 season, his 114 winners bettered his own record, and he outdid that with 118 the following term. Season 1993/94 was a most memorable one for Tony Herlihy. He toppled Maurice McKendry from the driver's premiership and won the newly-formulated Australasian Drivers Championship (waged at Auckland and Cambridge). On the way to his 124 wins for stakes totalling $1.4 million in his homeland, Herlihy guided the Purdon stable star Chokin to victories in the New Zealand Free-for-All and Cup and Auckland Cup. For good measure, he and Chokin easily took the Miracle Mile at Sydney's Harold Park and the Victoria Cup at Melbourne's Moonee Valley. After qualifying with a win, a fifth and a second in his heats of the 1994 Sydney Inter Dominions, Chokin had to be sensationally withdrawn from the Grand Final, due to an apparent bacterial infection. Herlihy gained substantial compensation by taking out the Trotters Grand Final with the Purdon stable's top square-gaiter of the time, Diamond Field. Boasting excellent New Zealand form with him, Herlihy reined him to second placings in each of his two heats, earning favouritism for the big event. His many supporters would have gasped as he broke and lost 50 metres in the early running. But he was not to be denied. Catching the field two laps out, he stormed home wide out to score by just over a length. For good measure, Herlihy and Diamond Field wound up a wonderful 1994 campaign by winning the Rowe Cup in Auckland. They finished third in the 1995 Grand Final (won in Christchurch by Call Me Now) and sixth in Melbourne in 1996 (won by Mark Purdon with Pride of Petite). Driving Pride Of Petite in defending her title at the 1997 Inter Dominion carnival in Adelaide, Herlihy reined her to a thrilling win in a close photo-finish, from a 40m mark. A year later, in Sydney, he took out the coveted event with the favourite, Buster Hanover, handicapped off 30m. This hard fought victory also confirmed Herlihy's claims for entry into the Inter Dominion Hall of Fame. In 2006 he scored his fourth Trotting Grand Final win in Melbourne with Delft, assisted by specialist pre-training beach work, and a fast start in the final. His 2009 runner-up finish with trotter One Over Kenny NZ, followed by a fourth place with Raydon in 2011, show his reinsmanship continues at a high level. From 12 appearances in Inter Dominion Pacing Grand Finals through 2011, Herlihy finished closest when runner-up with Chokin behind Golden Reign in Christchurch in 1995. In all, Herlihy's winning tally at Inter Dominion level including the 2011 series is 17 qualifying divisions with trotters and 12 with pacers. He won a Trotting Consolation with Breton Abbe in Christchurch in 1995 and Pacing Consolations with Ginger Man (1995) and Brabham (Adelaide, 1997). Apart from his grand Inter Dominion record, Herlihy boasts three New Zealand Cup wins with Luxury Liner (l988), Christopher Vance (1991) and Chokin (1993), while he has won an impressive eight Auckland Cups: Comedy Lad (1986), Luxury Liner (1987 and 1988), Christopher Vance (1991), Chokin (1993 and 1994) plus Sharp and Telford (1996) and Gotta Go Cullen (2008). Eight times New Zealand's leading reinsman between 1984/85 and 2004/05, Herlihy continues to add to his achievements. At the close of the 2008/2009 season, he led his country's honours list with 2870 wins and 59 Group 1 victories. That year his tally featured three Trotters Grand Circuit wins with One Over Kenny NZ, including the mare's second Rowe Cup, and making her the first Kiwi trotting mare to win $1 million. On the last night of season 2010/11, he claimed a second successive Drivers' Championship at Alexandra Park when he drove three winners, pipping fellow achiever David Butcher by two. In that same season, on 25th February, Herlihy became the first New Zealand driver to record 3000 wins, which represented an impressive average of some 91 wins/season since his first with Gymea Gold at Cambridge in January 1978. 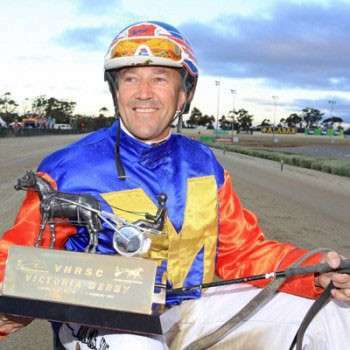 His consistency continued during 2011/12, when he by-passed the Inter Dominion (Melbourne & Sydney), and finished in the top five national drivers list. On several occasions, he again scored multiple victories in meetings at Alexandra Park and he captured a third successive driving premiership there with 59 wins. Classy performers such as Pembrook Benny, Triumphant Monarch, Ohoka Punter and Statesman featured among his successes, which reinforced his position as leader of the national 1,000 driving wins club. The highlight of 2012 would have been his New Year's Honour award as a Member of the New Zealand Order of Merit (MNZM); he was somewhat disconcerted, but was “honoured to accept it; a recognition like this is very special”. His driving skills are in great demand, as evidenced by his career figures of some 17,000 starts in New Zealand plus Australia by end season 2011/12; he has recorded over 3,100 wins and his prize-money tally is close to $31 million. Success as a trainer has also come his way. After serving for several seasons as right–hand man in the South Auckland stable of Barry Purdon’s youngest brother Mark, Herlihy began the new millennium by setting himself up as a public trainer upon Mark moving to re–establish in Canterbury. Fame and fortune in this role were quick to follow. On a memorable night at Auckland's Alexandra Park in October, 2001, Herlihy wrote himself again indelibly into the history books by driving seven of the 10 winners, four of them from his own stable. Since 2001/02, he has averaged over 55 wins per season as a trainer, with his horses' earnings for his owners in New Zealand alone already more than $7.2 million. Among his lead horses was One Over Kenny, chosen as the Grand Circuit Trotters Champion (2008/2009), with three major wins and a second placing, well ahead of Sundons Gift and Stig. This great mare retired at end 2010, after winning just over $1 million, and current stable "stars" include Livingontheinterest, Statesman, and Bettor Dream. Through his dual careers and strong performances as both driver and trainer Tony Herlihy has built up a significant presence and influence in the industry over some three decades. This was recognized at the 2011 North Island Awards night when he received the Racing Achievement Award during a "This is Your Life " style tribute segment.